Decided to build some Triplanes all at the same time, as I had 3 of them in the stash. They are the Eduard kit, the DML/Dragon kit, and the old Aurora Triplane (which is actually 1/43). The Aurora kit needed an interior and I add some pe sleeves to the kit guns. 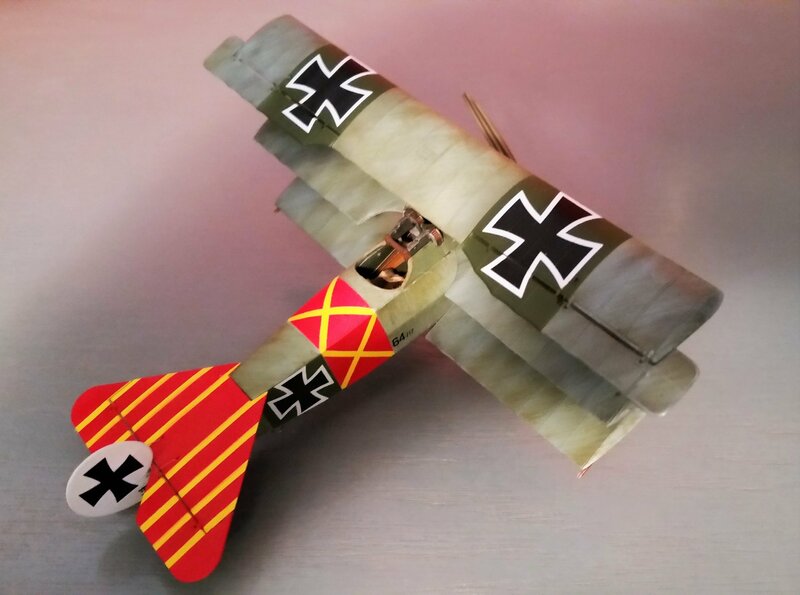 I used decals form the spares box to do Voss' Fokker F.I prototype and painted the face on the cowl. The DML kit is very nice, and was built out of the box mostly. It comes with steel pe for the cabanes and gear struts, as well as some additional pe detail parts. These strengthen the kit, but the steel pe is too tough to cut with a knife, so I used nippers. I also didn't want to try rolling the steel pe gun jackets, so I used a white metal Spandau from Aeroclub in place of the kit guns. Markings (again) are from the spares box to do one of Von Richtoffen's Triplanes. The Eduard DR.I has the best detail and best fidelity to scale, but is also the more difficult build. The plastic is soft and the thin parts are easy to break while handling. It also has the worst engineering for the struts and detail parts, making some experience in biplane building a real plus! I used the kit decals, which were one of the best parts of the kit. I experimented with different methods of adding the Olive streaking. The light blue on all three is MM Flanker Blue. Then I used Tamiya acrylic dark green and Khaki to do the streaking. In general, I used a "dry-brushing" approach with a short haired, medium brush. However, on the DML kit, I used a "wet, thinned" method, which gave a satisfying but totally different type of streaked finish. either way works pretty well. Question, comments, and critiques welcome, as always! Beautiful work on all three Gil. Nice work! Where's Snoopy when you need him! Nice work on all of them. How did you do your props? They look great. Awesome work Gil. Love the paint finish. All three of the props were painted tan to start. After that had dried for a day, I came back and dry brushed a dark brown lengthwise to apply the "graining". Simply go slow until you get the depth of finish and amount of grain that you like. The Aurora prop needed a pe boss added to its center, while other two were simply painted Floquil brass and the given a black wash. The Axial prop decals on all three came from the DML kit. Wunnerful, Wunnerful, Wunnerful, or in current vernacular - Sweeeeet, Sweeeeet, Sweeeeet. Interests: I build 1/72 scale aircraft; when I was 26, it seemed like a good idea at the time--more shelf space; but now not so sure. I'm still committed. 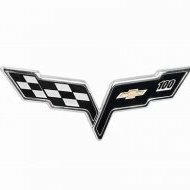 My special interests are World War I, American interwar period, and U.S. Air Force aircraft. I think you did a great job on your triplanes! I worked on the 1/48 Eduard kit and enjoyed the build. I agree with you that some of the kit parts were challenging...I broke one of the I-struts; it wouldn't fit right in the mid wing slot, and when I tried to pull it out...well. I fixed the strut and sanded it before placing it back into position. I experimented with different ways to accomplish the streaking effect too. I ended up using Tamiya light blue acrylic as the base and then I sprayed a semi-gloss coat on the wings and fuselage. I did that to reduce the chance losing the blue paint when I did the streaking. I used Testors olive drab enamel and applied it using an angled brush. I still lost some of the blue paint on the wing ribs, so I decided to shoot a very diluted Tamiya light blue and that did the trick. One of the things I had a hard time with was the tail plane. The aircraft was flown by Lt Werner Steinhauser of Jasta 11. The Eduard instructions showed the tail plane yellow with red stripes, but the Osprey book showed a red tail with yellow stripes. In a later version of Steinhauser's triplane, the Osprey book showed it with a Balkan Cross and a yellow tail and red stripes; since my version had the Maltese Cross, I went with the Osprey variant. I attached a couple of pictures of my triplane. Again, your triplane collection was well done! Love it! Your version may be more correct...it makes sense the tail planes would more exactly match the fuselage band. And...I broke the EXACT same I strut! Glad you didn't struggle with it as much as I did. Thanks for sharing your build! Welcome to the Forums John, and congrats on doing such a fantastic job in the 1/72 scale triplane! I also build almost exclusively 1/72 scale aircraft myself. I'm thrilled to see you join us here. Wanted to thank you for the welcome and your thoughts on my triplane. 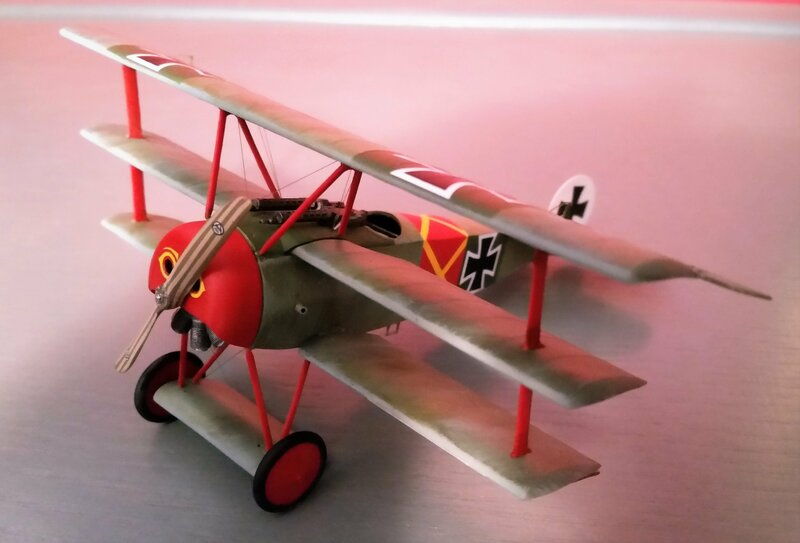 I have to admit, I had a weak moment; the triplane I built was the 1/48 scale Eduard Kit. That said, I have 5 or 6 1/72 scale triplane kits in my stash that I will get to soon. Right now, I'm working the 1/72 Italeri Fiat CR 32 that I hope to have ready for Nationals. Look forward to future discussions on the forum! Excellent! You're welcome John. It's been awhile since I did a triplane myself. I did do the CR-32 kit some years ago. that was a fun one! I do hope I can make it to the Nationals to see this in person.